It doesn’t think. It doesn’t feel. It doesn’t give up. It follows. The trailer taglines are simple, reflecting an effectively streamlined concept. The soundtrack is similarly methodical, continuing to follow even after one has turned the music off. Wherever you are, wherever you go, it is coming right for you. The movie makes the best out of a low budget, a smart script and a primal fear. Disasterpeace‘s score is spot-on, a clear homage to John Carpenter’s Halloween that manages to be fresh and retro all at once. It’s one of the best scores you’ll hear all year. It’s also one of the best synthesizer LPs of recent years, and yes, there will be vinyl. This genre does have a few hallmarks, all of which are all on display here: staccato strings (Psycho), brooding bass (Halloween), swirling drones (Under the Skin), building volume and pitch (too many to mention). The genius of Disasterpeace (Rich Vreeland) is to put these all together, and to vary the tracks so that they play as well as an album as they do on screen. The surprise is that prior to this work, he was known for happy, videogame-inspired music, especially FEZ and Monsters Ate My Birthday Cake. It Follows seems way outside his comfort zone, and yet, he nails it. Or shall we say, he follows it, relentlessly, purposefully, until he catches it and wrings its neck. The mastering and clarity are suburb, as one can tell immediately upon hearing “Heels”. The drums are like huge hands, pounding on a door; the synths are like footsteps. Then the two are combined with staccato stabs and hive-like drones. This is almost dubstep, but it’s not; instead, it’s a new take on an old template. The Halloween references apply to the title track, as the lighter, bell-like tones will remind many of Michael’s theme. But that’s okay; we want to be reminded of that classic, and then we want a little more. This villain, like “The Shape”, is seemingly unstoppable, but as one character mentions, it is slow; there’s usually time to escape, but only if one is paying attention and is in a place with more than one exit. The strongest tracks supply an air of approaching menace. “Anyone” is soft at the start, but accumulates power as it draws nearer, leading to the tense “Old Maid”, which in the film involves a rotating camera. The last seconds of “Company” are among the eeriest of both score and film, while the twinkling bells, amassed drones and attacking synths of “Doppel” arrive like slow, inevitable fate, followed by an ambush of drums. Of all the tracks, this one is the most distinctive, sounding more like the work of Ben Frost. And the accelerating percussion of “Greg” … well, let’s just say one should get out of the house right now. 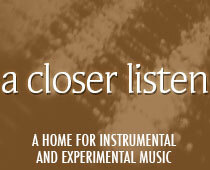 “The mastering and clarity are suburb…”. I’m not sure if the use of “suburb” here is used on purpose, as the setting of the film is the Detroit suburbs. Or, you actually meant to type “superb”. Either way. Nice review. This is the rare error that makes sense ~ it was not intentional! Thanks for letting me know ~ I’m going to keep it in for fun.